It's actually pretty sturdy. It has a cardboard sleeve (with a gross picture of kissing babies) and a very solid pull-out drawer with a pretty printed red glitter pattern and light blue lining. You could totally use the pull-out drawer for something once you take the gloss out, but I can't think of what. Change tray? Makeup organizer? No clue. It feels too nice to throw out. This is what you see when you pull out the drawer. It contains lip shines in Peppermint Bark, Candy Cane, Pink Frosted Cookie and Have a Cherry Christmas. Ooooh, they're so pretty. Peppermint Bark is a sheer red shimmer, Candy Cane is clear, Pink Frosted Cookie is a sheer pink shimmer (but essentially clear), and Have A Cherry Christmas is a slightly lighter sheer red shimmer but looks almost the same as Peppermint Bark. Peppermint Bark, Candy Cane, Pink Frosted Cookie, Have A Cherry Christmas. As you can see, they're really sheer, only the two red shades add a small amount of color. Peppermint Bark has a chocolate peppermint type scent. Reminds me a bit of C.O. Bigelow Double Chocolate Shake Mentha Lip Shine. Candy Cane is straight peppermint- and it's STRONG. Pink Frosted Cookie is harder to describe. It has a vanilla cake type base but a sharp perfumey fruity sort of scent on top. It's not smooth like cupcake or fresh like strawberry, I find the scent a little odd- it has a distinct 'perfume' type smell to me. Maybe a bit like Philosophy Belgian Waffle Cone mixed with Sugar Plum Fairy? Have A Cherry Christmas might be my favorite one- it has a very sweet candy cherry scent. It's not too fake or sour or sickening like cough medicine. Cherry scents can be a tricky territory, but this one is just right. Not realistic cherry, but definitely not cough syrup! All of them are slightly sweet tasting, so there's not just scent in them. Very pleasant, no funky Stevia bitter taste, which I'm thankful for. The texture is thick and marginally sticky. Not extremely sticky, but enough for your hair to get stuck in it on a windy day. They feel a little more moisturizing on my lips than the average gloss and I don't feel like my lips are dry after they wear off. I like that they're really strongly scented/flavored. 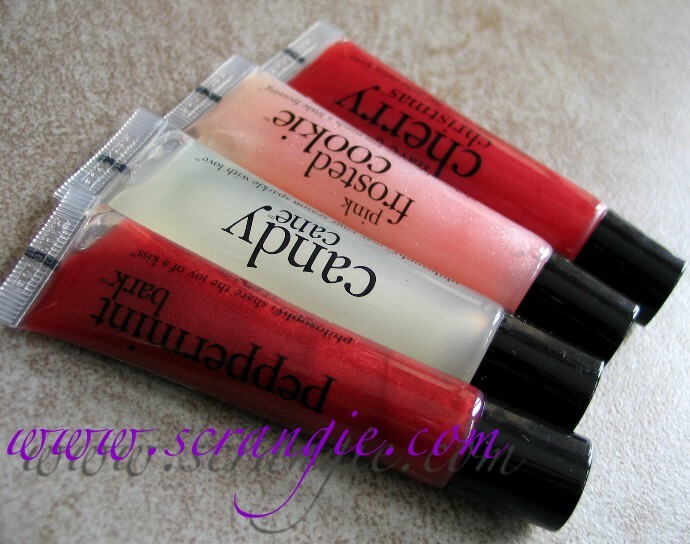 I like my lip products flavored and scented, and as long as the scents are good, the stronger, the better! They're not so strong that they'll make you sick from smelling them, but they're strong enough to smell for a while after you apply them. I'm a pretty big fan of Philosophy's lip shines, and really a pretty big Philosophy fan in general. They make shower gel that smells like cake. How could I not be? I love that they always do scents that appeal to me- Red Velvet Cake, Sugar Cookie (which doesn't smell like sugar cookies, more like lemons), Pumpkin Spice Muffin, Ooey Gooey Smores (quite possibly their best lip shine flavor EVER), Cinnamon Buns, Snow Angel (smells like angel food cake! ), Gingerbread.... the list goes on. I'm rarely disappointed by the lip shines. Anyway, I thought this set was a pretty good deal considering that these would each be $10 individually. Good quality, nice scents, attractive packaging, overall just a nice little set. Why don't people get me things like this for Christmas? I really don't want another pair of driving gloves that I'll never wear. Hmph. I just got this set as Hanukkah gift from my husband because I've been addicted to their lip shines since he gave me the S'mores one. The cherry one's my favorite, too! I just love everything Philosophy does. I love their lip shines(great stocking stuffers), but it's their shower gels that do it for me. I just bought the Cookies 'N Creme one, and it smells soooo good. I want to eat myself! If that were a lip shine, I'd buy ten. I have never used any of Philosophy cosmetics, mostly because we dont have that brand here in Croatia and samples are hard to get. These glosses look really good, and if they are thick and sticky, thats my thing :) I dont like thin and runny glosses. I bought this! My favorite is peppermint bark. It looks really good, I like it! i love philosophy, but have never tried their lipshines. however, there was a gift set that i saw on qvc they were selling that i asked my mom to get me (yes, i am still that daughter, bwahaha) and it comes with a lipshine so hopefully if she got it i can try it out. about the picture, i bet the company thought that would be SO cute! for their glosses, but it disturbs me a bit. These Philosophy glosses always fall short for me. None of your descriptions sound like something I'd like so I'm not surprised. Love those glosses. I'm still using one from last year. It's on my desk with a couple of more lip balms and lipsticks. I'm so tempted by everything out right now. All I need is lots of money. I know what you mean about why people don't get you that type of gift.